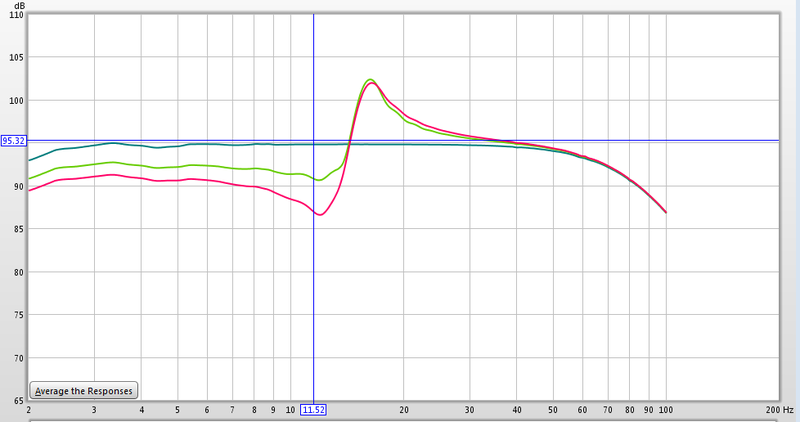 I'm having some trouble setting up my EQ with MiniDSP since the filters behave erratically as you low the frequency. 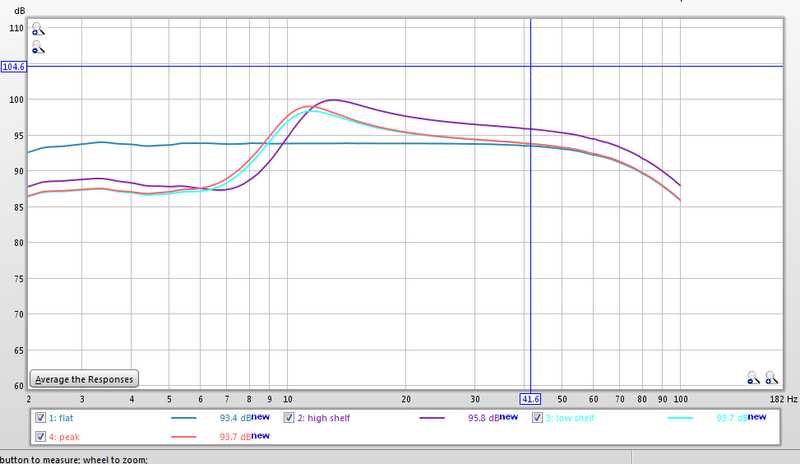 Here is the same PEQ except one is set to 15hz, and one is set to 10hz. This is a low shelf with a gain of 2 and Q of 2. The measurements are looped back to the computer. 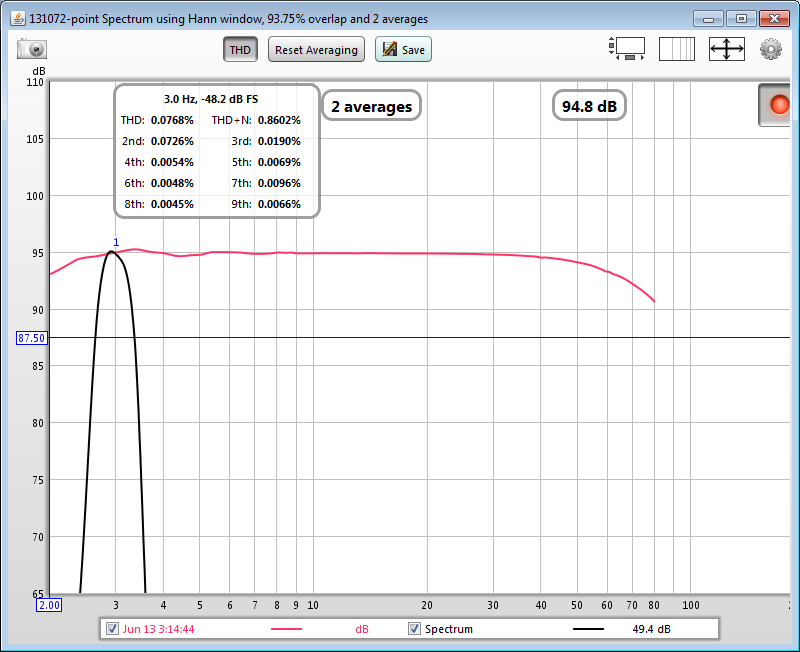 Blue is flat with everything disabled, gold is at 15hz, and green is at 10hz. 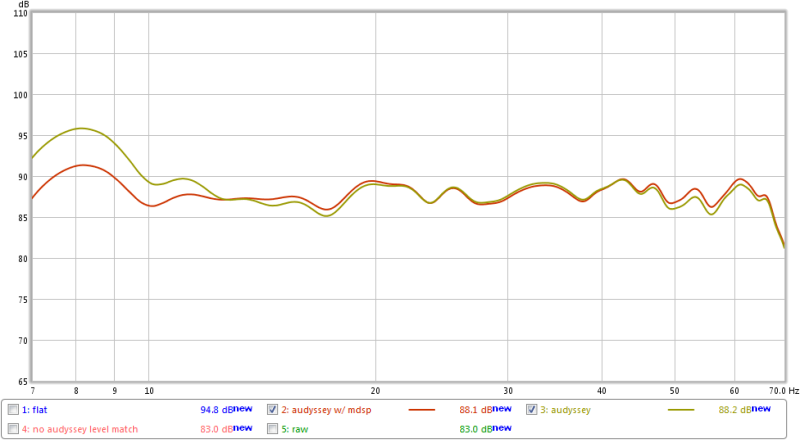 To test, I changed the frequency from 15hz to 10hz one at a time and graphed it. Note here, that the 11hz line drew exactly over the 12. I tested this multiple times. 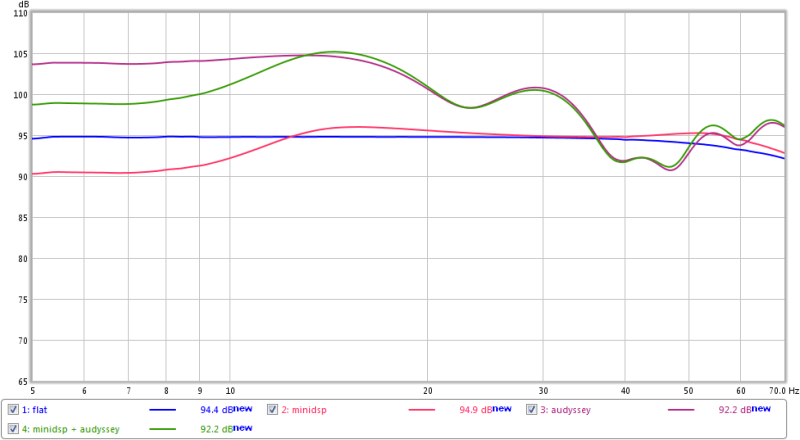 Somehow during testing when I had it set to 10hz, it drew a line (light blue) where the 11hz line would have been. 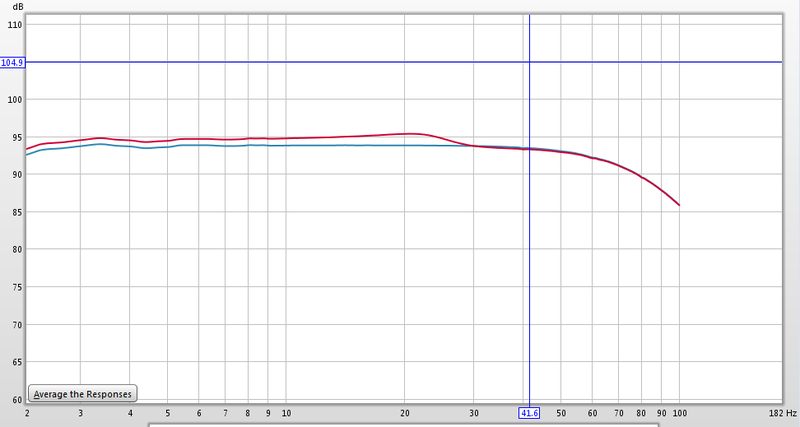 This is what a low shelf filter (red) vs flat (blue) looks like at 25hz. This is the same settings as above, except 25hz instead of 15hz. 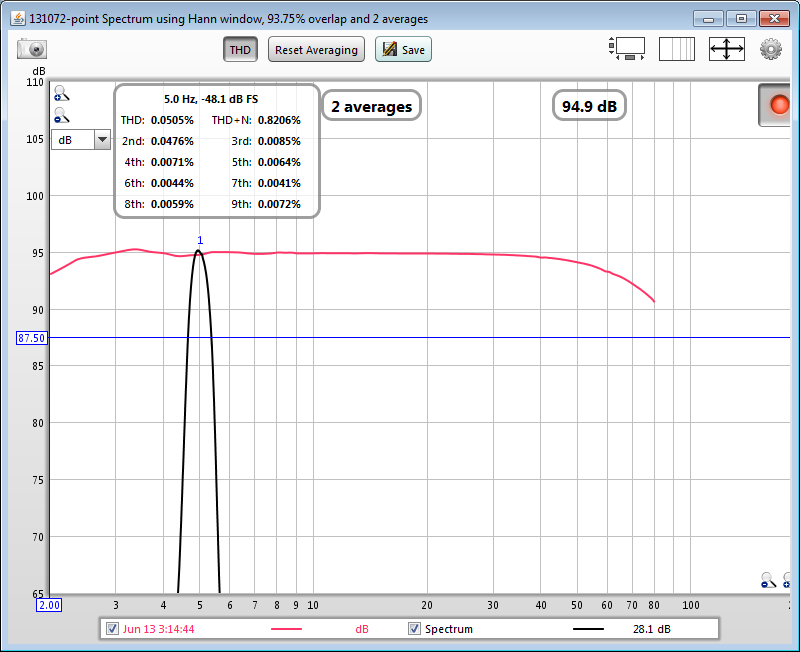 This is high shelf, low shelf, and peak, with gain 2, Q 2, all at 10hz. Again, this behavior is not right. Is this a known bug? If so is there an update coming out to resolve this any time soon? Without a working PEQ in this low frequency range, or biquad functionality, this 2x8 board is kind of useless to me at the moment. Last Edit: 7 years 10 months ago by nyt. 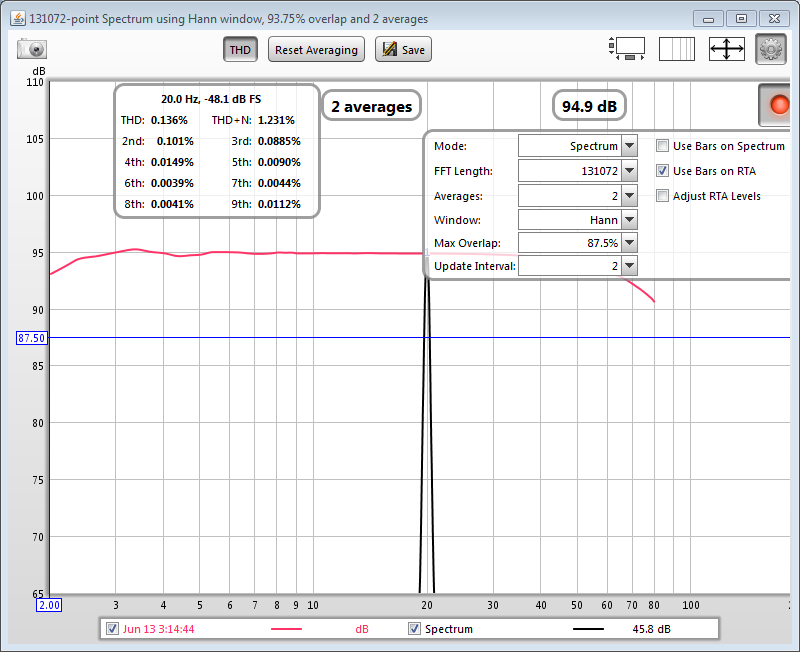 Alright, so let me try to explain what's going on here..
- First off, not sure if I see that graph correct, but it seems like something odd in the measurements.. With our Audio Precision (renowned testing/engineering tool), we've never been able to see the low frequency extend to 2Hz the way it does on all your measurement system (barelly -2dB @ 2Hz??)..e.g. last graph being technically just not possible... 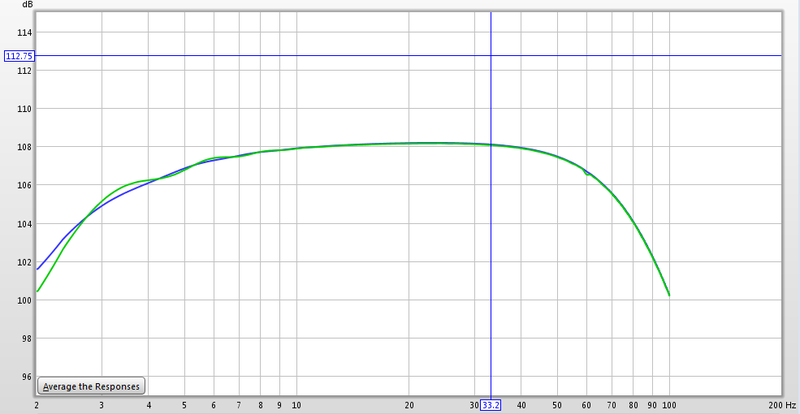 I therefore wonder on the accuracy of the low frequency fft. (maybe smoothing of your FFT settings?) There MUST be a natural roll off somewhere to remove the DC component else the ADC will certainly not be happy..
- Right now, while the biquad values are correct, the software does not show that tailing at the very low end (below 10Hz)and results of applying hardware HPF + digital filter. We could add the RC filter to the plotting of the response in the software. - The second option (more valuable) would be to apply some behind the scenes calculations on the biquad to try to tame overshoot or apply more gain when you place your filter right at the roll off (i.e. 10Hz). We wouldn't be able to change the roll off below that this being said. You MUST have a roll off especially in 10Hz and below..
- Third option could be to make miniDSP what 99% of DSP out there do, which is to limit the frequency response to 20Hz for all filtering. (i.e. therefore not having to worry about roll off of on board HPF). We initially added 10Hz support to help the community to add some PEQ filters within that range. Maybe we should just remove that feature from the plug-in though I think that so far, all the community members enjoyed that feature and lived with the small limitation of the natural trailing of the board's response. I'd therefore feel it would be a shame..
Last Edit: 7 years 10 months ago by devteam. 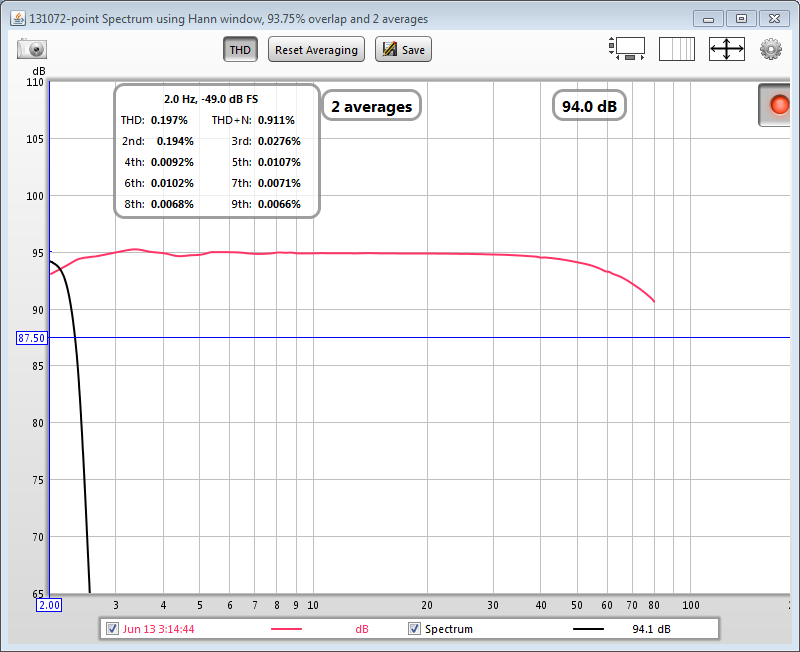 The reason I bought the MiniDSP is to have control below 20hz. I have 56,000w of amps powering 8x LMS 5400 ultra 18" drivers in ~35 cubic feet of enclosures. I need to EQ out some issues on the bottom end, and with Biquad filtering and 10hz PEQ adjustability, the MiniDSP was a logical choice. Unfortunately, you have not released the biquad software for the 2x8 yet, and the PEQ functions in that frequency range are all broken. Hopefully that is pushed out in the near future. Trust me when I tell you my measurements are accurate. They are were directly from soundcard out (hdmi), to the preamp, to the minidsp (balanced), to soundcard in. Calibration for the soundcard rolloff was applied. Perhaps you should try this sometime on your measurement gear. You can see below in the posted graphs that the measurements recorded directly from the MiniDSP translate directly to a measurement taken from a professionally calibrated microphone. These were taken from the output of the MiniDSP. Blue: flat (measured off minidsp with the filters bypassed. These measurements were taken with a WM-61A microphone capsule powered by a Linkwitz designed power supply. This mic has been professionally calibrated down to 5hz, and it was almost linear to there barely needing any correction. red: with minidsp with the curve above in use. I don't want options on how to work with this, I want the software fixed, as there is clearly a bug. Your shelf filters simply do not function properly in that frequency range. Low shelf, peak and high self filters end up looking nearly identical. Changing the gain or Q value often has no effect. Sometimes changing it by .1 completely changes everything and adds +5db or some other random value that you wouldn't expect. Your peak filters in that frequency range are not even close to being a peak filter, but look more like a rising edge trigger when Q is raised. Furthermore, I'm still waiting on a reply to my email since you sent me a board missing a component on the #1 unbalanced output, making that channel useless. Here's to hoping you re-read the first post in this thread and address these issues. I am not very happy with this response, and the lack of response to my two emails which someone has definitely read regarding the poor QC and missing components on the board. Ok, a couple of comments and keeping the whole discussion objective/and positive in finding a solution..
With this said, we've never said that your whole results were inaccurate. We're indeed able to see that at very low frequency, the behavior of combining PEQ + natural HPF leads to some unstable behavior related to 2 filters (HW + DSP) combining. As we said earlier on, we'll work on trying to find a solution and will see what can be done to compensate for it. The REW version of this plug-in is also scheduled (with some other features) so you'll be able to input the biquad yourself... Hoping this clarifies and removes any misunderstandings. - Response to emails: We've indeed received your emails and replied twice already. A set of inductor will ship early this week. Unfortunately it seems like your email server "countercultured.net" is either bouncing the emails or maybe check your junk filters/folder? We do take the issue seriously. Please send maybe another email address to us in case. It looks like your SMTP server has found its way onto a few RBLs. You may wish to take care of this. I have sent you a new email address to contact me at. Regardless of the rolloff, the PEQ settings below 20hz are very broken. I hope this gets fixed soon, and hopefully the biquad programming gets released soon as well. Thanks. Also, I'm not sure exactly where your rolloff numbers are coming from, as my tests are clearly showing 1db rolloff at 2hz. 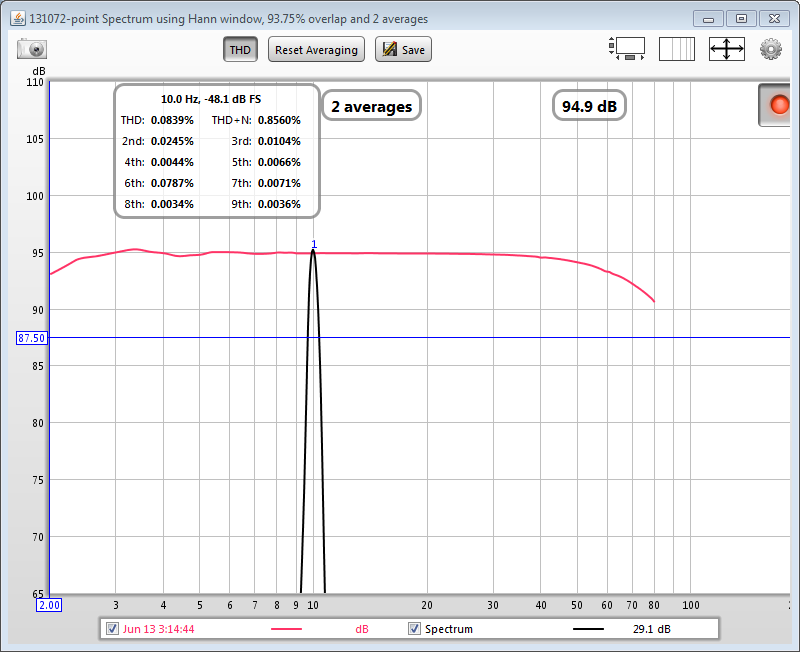 Measured sweep in red, sine wave test tones in black with THD data. Nyt, if you did your REW cal with the MiniDSP in the loop the miniDSP's own rolloff would have been calibrated out so would not appear on the plots. Try a plot with the soundcard cal cleared to see all the rolloffs of the chain, or do the cal without the miniDSP. For best accuracy at the very lowest frequencies make sure the impulse response windows are set very wide (say 1500ms for the right hand window), that should clean up any rippling at the lowest frequencies caused by early window truncation of extended LF responses. Devteam, Passive RC roll-offs cannot combine with biquads to create overshoot. A more likely problem is numerical ill-conditioning in the coefficient calculations, leading to slightly inaccurate coefficients, as the 2x8 runs at 96kHz it will be more sensitive to this than the original miniDSP. If that is the issue the coefficient calculation formulae may need some recasting to reduce it (e.g. replacing 1-cos(x) by 2*sin^2(x/2)) or use quad precision for the calcs. My calibration is without MiniDSP in the loop. There is definitely some kind of mathematical issue going on with these formulas. This is easy to reproduce and see. Thanks for the follow up. After talking to the Engineering team, you're indeed correct that the passive RC wouldn't explain the overshoot. It only explains the roll off of the response. They will have a look at it closely shortly and I'll be able to give feedback by then. The calibration files used in the previous measurements had the AVR in the loop, so I could see exactly what the MiniDSP Was doing. Any news from the devs on this? Engineers will look into it asap, but FYI you just posted this just less than 2day ago over a week end (i.e. less than 24h since our team is aware of it), so I don't want to set expectation too high that we're going to release a new firmware within the next 30min..
As we already mentioned over email, we're working on understanding the problem and have allocated engineering resources for that matter. We'll let you know once we have a fix for a tested solution(i.e. plug-in release). Following quite a lot of hours of brainstorming by our team, here is a quick update. This work is still in progress so please take this information accordingly. Our team has indeed been able to reproduce the unstable filter in the sub frequency range. Some of the effects being more obvious as you get closer to 10Hz. This quantization problem was most likely missed as these symptoms wouldn't show on our Matlab or UI charting of the plots. The reason being that we are full floating point through out our calculation on the UI. While the main reason for instability being the fixed Point DSP architecture of the unit, its implementation of the IIR filter by the IC and high sample rate (96kHz vs very low frequencies). At this point of time, a couple of ideas are under progress and being worked out, but none of these are a quick magic wand solving all the problems. They involve some pretty deep math to solve the problem of quantization and the fact that on some coefficients, the effect of one LSB (least significant bit) has a major effect on the response..
With this said, we won't pronounce ourselves on whether we'll be able to solve that issue or not. There are a couple of things we're considering in the mean time.. We'll let you know what comes out of these investigations. Thanks for your patience. In the mean time, note that a beta version of the miniDSP 4x10 providing REW support is now available. Maybe an alternative that you may want to consider but note that the limitation is not in the software here, but rather the fixed point DSP structure of the current algorithm. Thanks for the update. Please continue to keep me updated on this problem. Will this issue also affect EQ done with biquads?